I cling to the handle bars as I race down the mountain on a bike. It’s so rough that, with small rocks and gravel making up the road, my seat vibrates too much for me to sit. Instead, I stand on the pedals and resist the urge to hit the brakes. I’ve already figured out that if I break too hard, I slide sideways. Inside my head I keep repeating, “It’s okay. I’m good. 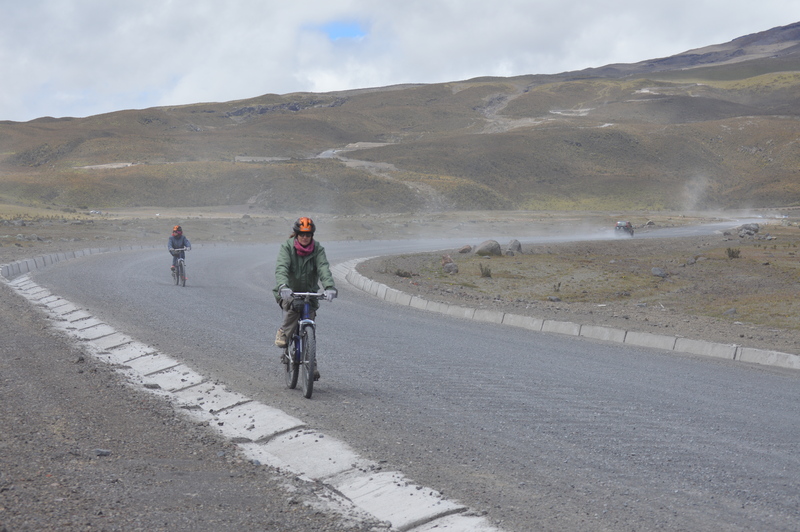 I can do this.” Really, I’m not so sure riding bikes down the Cotopaxi Volcano was such a great idea. 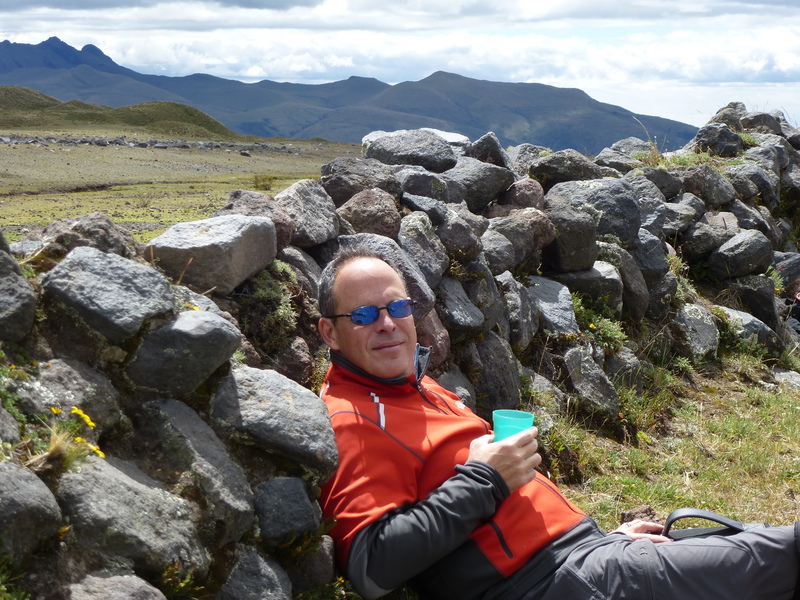 My husband Rafael, our 13-year-old daughter Rachel and I are at the Cotopaxi National Park in Ecuador, just south of Quito. 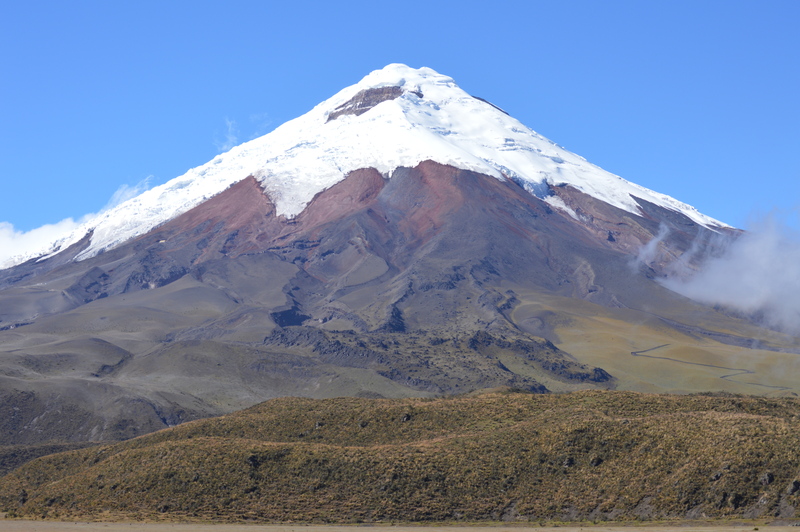 I’m the one who signed us up for the tour, which includes a ride to the park, the chance to climb a part of the volcano, and then a 25 mile bike ride, starting on the side of one of the world’s highest continuously active volcanoes. Sounds great! Our guide even throws in some winter jackets for us to wear since we don’t have anything warm enough. The drive to the Park is beautiful. The scenery is gorgeous, all jagged gray mountains, crystal clear lakes and verdant green valleys. 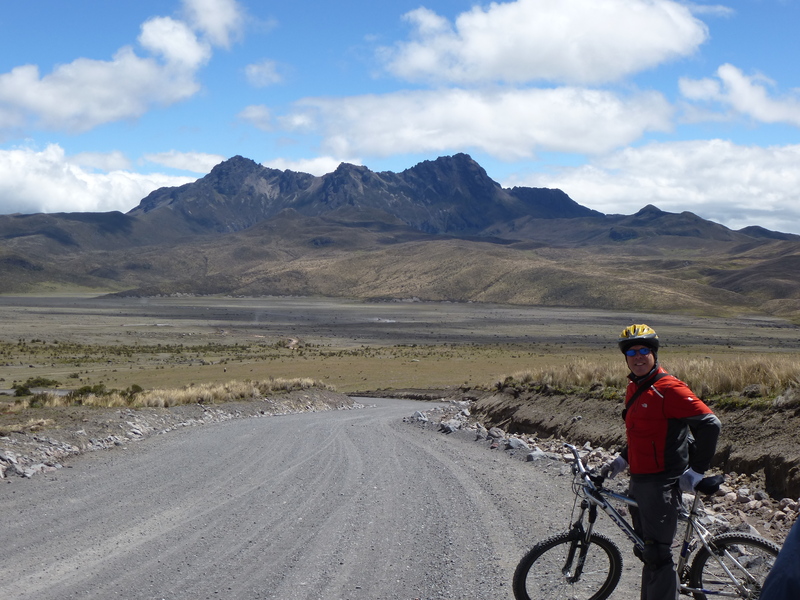 Once we reach Cotopaxi, we are driven up to a parking lot where we will start our bike descent. 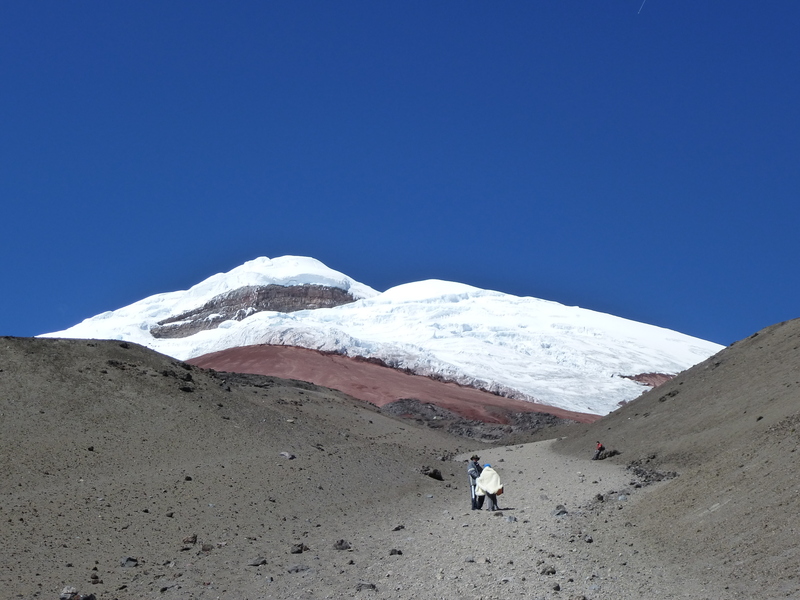 First, though, we have the chance to climb up to the Jose Rivas Refuge at 15,953 feet. The wind and cold at this height are fierce. The air is very thin for anyone not used to it. Rafael is the only one of us to make it to the top. Rachel and I are content to sit on the side of the trail and enjoy the scenery. After the climb, we get on our bikes and start downhill. Rachel and I are not mountain bikers and that was immediately obvious! It is tough going. The views, though! We make it to the bottom fairly quickly since we are afraid to use our brakes too much. Then it is a ride through fields, dirt roads and small wooded areas. We stop for a picnic lunch in a field of grazing horses. It feels nice to get off the bike and walk around. A couple hours later we are done. Yippee! This is one of those adventures that you are glad you did, but are happy it is over! Courage Level: 3 This is not a walk in the park, but it is not as scary as some other things we have done. The worst part is controlling the descent of the bike on the mountain. If you are good with mountain biking, you should be fine here. Once off the mountain, it is much easier. Fitness Level: 3 Luckily, there is not a lot of uphill pedaling. A couple times, my daughter and I have to walk our bikes up a hill because we just cannot get enough breath to do it while riding. If you are in reasonably good shape, you can do this. If your tour company does not provide warm jackets, then you need to bring them, as well as ear warmers or scarves. Gloves were provided for us. Sneakers or hiking shoes work well. Wear sunglasses. Make sure you have something with a pocket for your camera. I used our Olympus Tough and just held it and let it bang against the bike handles. We used Aries Bike Company. The guide, who rode in a chase car in case we had problems, was very nice and accommodating. He served a huge and yummy picnic lunch. 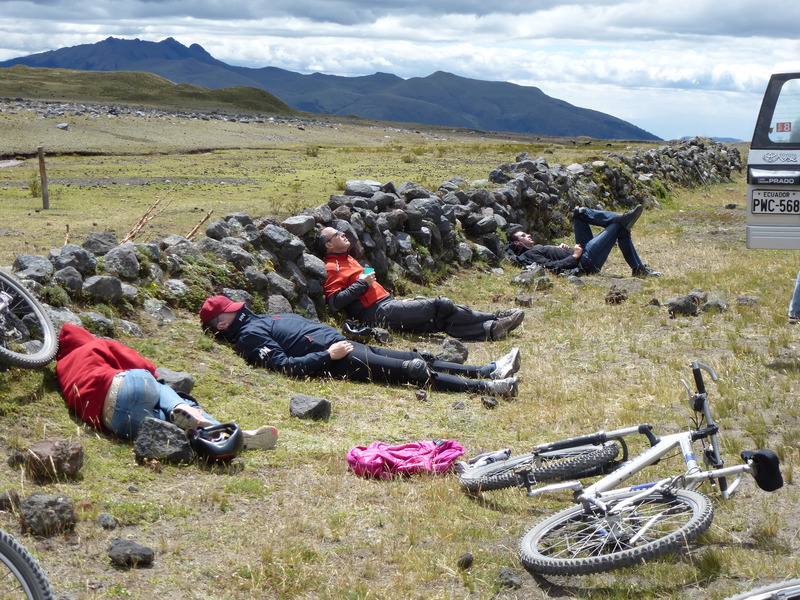 The cost was very reasonable for the Great Cotopaxi Mountain Bike Tour. In Quito, which is where they pick you up for the tour, we stayed at La Casona de la Ronda. 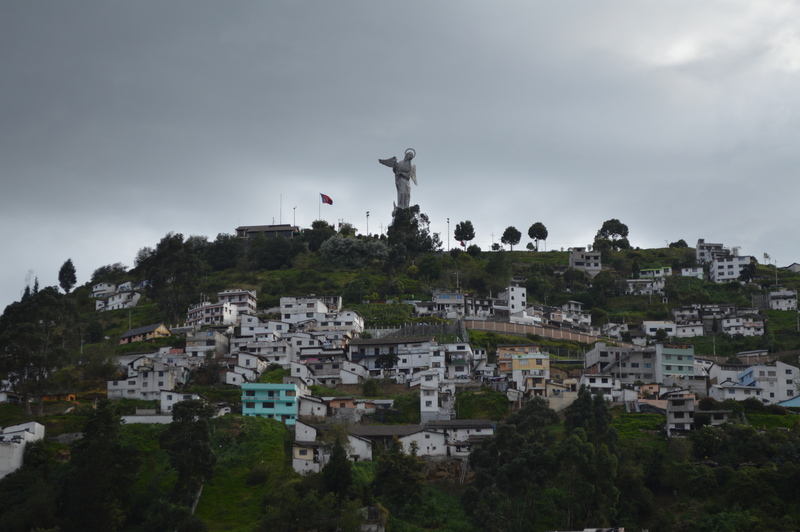 This was a great place in the Old Town, with a top-floor living room complete with a view of El Panecillo (the statue of the Winged Virgin that you can see above Quito.) The rooms and breakfast were wonderful and the staff was incredibly nice. When we asked one of them for directions, he came with us for three streets to make sure we didn’t get lost!